Home » WOD Blog » What does your Christmas look like? What does your Christmas look like? Notes: Handstand Push Ups should be the limiting factor in the workout. Scaling should be such that allows close to continual movement, perform regular or ring pushups as needed. The Farmers carry is 50′ out and back with a weight in each hand, feel free to use dumbbells as well. Notes: Farmers Carries should be performed with two barbells. The 100′ should be broken into a 50′ down and back. What does you Holiday look like? When I think about Christmas I realize that my image is far from that of most people I have met in the states. I think of Christmas in Namibia. For one thing, my christmas is in Summer. My father’s side of the family is German and my mother’s is English. So we have a cultural blend. We typically start baking Christmas cookies around 3 weeks before Christmas. 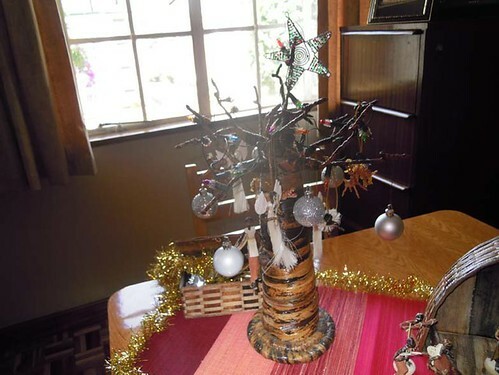 We set up our baobab Christmas tree in true African style. Usually we will also have an English pine tree with real candles attached to satisfy my mother. Houses tend to be made out of brick and clay, not wood, so fire is not as much of a concern out there. On December 23rd every year my family goes Christmas-carol singing at a Christmas by candlelights in the botanical gardens with friends. Then Christmas eve comes. We all head to the beach first thing in the morning and hide out in the sun and in the ocean, away from each other, getting as much peace of mind before the big family gathering. Everything is in walking distance. By 4pm we gather up to get ready for church. After church Santa has magically put all the presents out. As we wait for dinner we drink tea with orange juice or gluwine and eat cookies and traditional German Stollen. Our traditional Christmas dinner is volavance, a pastry cup with veal, chicken and mushroom sauce. We eat this with rice, peas and salad. For desert; brandy-lit Christmas pudding served with custard. Then we sing Christmas carols for a couple hours, light the candles on the tree and crack nuts. Eventually we all get to open two presents. Only one person opens at a time, so everyone else can admire it. On Christmas day we meet up at the pine tree. After several more Christmas carols we finally get to open the rest of our presents. Still, only one present at a time, to ensure that every gift gets a suitable number of oohs and aahs. Then if English family is around we will have our big turkey lunch before heading to the beach, otherwise its just straight to the beach. Typically we’ve had enough of each other at this point and go our separate ways. Things have changed somewhat since I’ve moved to the states. For one thing, I have no intention of spending the day on the beach or in the ocean. Furthermore, the US is far from my family, so there is no more big family gathering. When I spend it with my parents, we typically spend the morning doing something athletic, run, bike etc. Then in the evening we get dressed up and spend most of the night in a bar. We come home and open a present each. Christmas day we open the rest of the gifts, let the volavance nurse our hangovers and watch a movie together. We still have our baobab tree and traditional foods, but most of the traditional festivities have faded. Baking cookies really set the Christmas tone in the past, but now I don’t want them hanging around the house. I have no desire to spend hours singing Christmas carols, and I’m certainly not going to light candles on my Christmas tree here. What do you think of when you remember Christmas, Hanukkah and the Holiday season?